Two weeks or so ago, 14th February, there were two avalanche accidents within a few kilometres of each other in the foothills of the North Eastern Alps near Salzburg. In each accident, one person died. Both accidents occurred within spitting distance of where I was working as a ski instructor. In one accident the victim skied from the small ski resort into steep wooded terrain alone. There were various small avalanches in the area and he was presumed to have been caught in one of them. He has not been found. The other accident was on a tour that is clearly visible from the ski resort. I would like to make some comments about the ski tour accident just outside of the Gaissau / Hintersee ski area. The mountain "Regenspitze" is a small mountain that reaches an elevation of about 1700m or so. Pretty tame. A report about the accident (in German) can be found at http://www.lwz-salzburg.org/ereignissedetail.asp?ID=54. On the Saturday in question, there was heavy snowfall, strong winds and very poor visibility. This means that during the day avalanche danger would increase, new snow deposits would develop, there would be limited, if any, ability to see terrain (slope angles), pillows of wind deposited snow and potential rescue efforts would be severely hampered. The accident occurred on a northwest slope that was 35° steep. The initial slab released in an opening on a slightly wooded slope that funneled into a gully. A second fracture followed from a deeper buried weak layer. The height of the crown was 80 to 90cm and 150m wide. The length of the slide was about 400m. Three people were caught. One died from trauma inflicted during the avalanche, one person was severely injured and buried up to the chest and shoulder and the third person was unhurt. 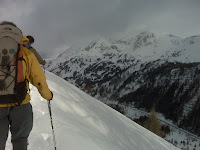 Using various avalanche risk evaluation methods (i.e., Munter 3X3, Stop or Go, etc. ), backcountry skiers should stay on slopes that are not steeper than 30° when there is a high (4) avalanche level. Secondary factors such as new snow, wind, poor visibility and questionable terrain features add to the potential risk. Additionally, 65% of all avalanche fatalities occur on slopes with a north-facing aspect. In hindsight, it is clear that the decision made by the group to ski this line was poor – whether or not a slab released or a death occurred. In the mountains, people are generally lucky. In other words, they get away with making poor decisions and do not suffer the associated consequences whether they are ski touring, ice climbing, mountaineering, etc. This leads to a false sense of security and a thought process of, “we did this last time and nothing happened”. Furthermore, many back country skiers think that there are tours or slopes that are avalanche prone and others that are “safe”. When people make questionable choices in the mountains, they get away with it because they were lucky. Just because nothing happend does not mean the right decision was made. What makes a ski tour or slope safe is not the tour or slope itself, but the conditions in which it is skied on and the manner in which it is skied.